Nervous about shipping a guitar? Don't be. Shipping a guitar, bass or other instrument is a lot easier than you might think. Take a look at this video and see our recommendations on how to pack and ship a guitar as safely and securely as possible. Before the guitar is even in its case, there are some important steps you can take. (Don't worry: If you're shipping without a case or gig bag, these same steps apply). Loosen the strings. You don't necessarily need to detune entirely, but it's a good idea to lessen the tension on the neck at least somewhat. Secure any movable parts. Nothing should be able to rattle around during transit, so it's important to secure components such as tremolo bridges. This can be accomplished by wrapping the part in newspaper or other packing material. Wrap the headstock. The headstock is a very sensitive part of the guitar, so you want to make sure it's nice and snug. Again, wrapping it in newspaper, bubble wrap or other material will work just fine. Separate strings from fretboard with newspaper. This will keep the strings from smacking up against the fretboard in transit. Simply take a strip of newspaper and slide it between the bottom of the strings and the fretboard. The idea here is to prevent the guitar from moving during shipment. 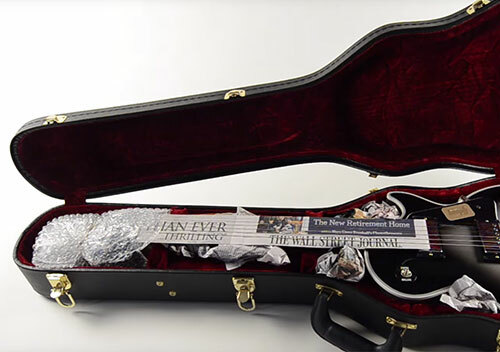 You want to remove empty space in the case by filling any areas around the guitar with balled-up newspaper or other packing materials. 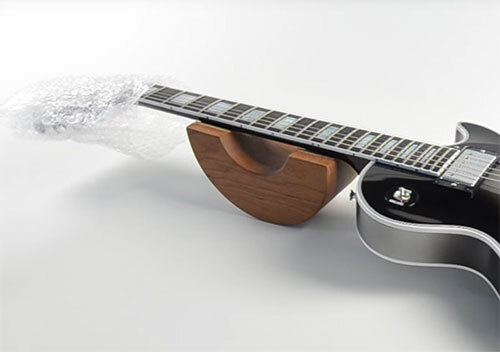 Think of it this way: If there's no empty space within the case, the guitar won't be able to shift and slide around. The same principle applies for the case inside the box. Try to fill in any empty space so that the case and the guitar are as snug as possible. Again, the idea is to eliminate the potential for the case to move around within the box. Now all that's left is to seal the box with packing tape and send it on its way. And that's all there is to it. With this simple process you can rest assured that your guitar will get where it's going safe and sound. Now that you know how to ship a guitar the right way, it's time to list some more gear on Reverb!